Not only are gray wolves thriving in the exclusion zone, they are starting to wander out into the rest of the world as well. After the 1986 fire and explosion at the Chernobyl Nuclear Power Plant released 400 times more radioactive fallout than the atomic bomb dropped on Hiroshima, most everyone left the area. Authorities created a 18.6-mile (30 kilometers) “exclusion zone” in which people were (and still are) prohibited from living. But apparently, the animals didn’t get the memo. A few years ago we wrote about how wildlife is thriving at the nuclear disaster of Chernobyl. What’s terrible for humankind proves to maybe not be so bad for animals, as the whole exclusion zone has become an ersatz nature preserve, rife with elk, roe deer, red deer, wild boar, foxes, wolves, and others. 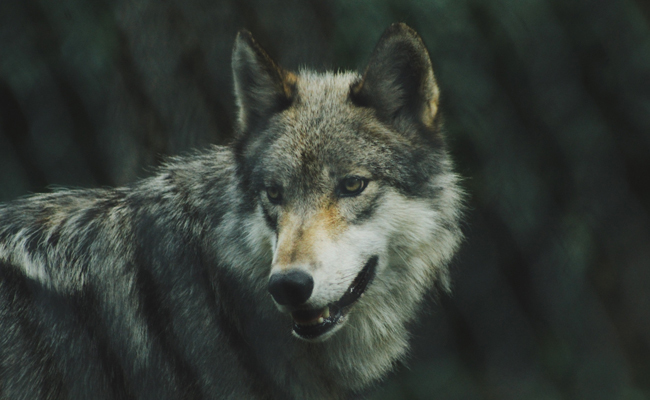 Gray wolves (Canis lupus) are one species which appear to have benefited from the lack of human disturbance, with estimated population densities in the CEZ that exceed those observed in other uncontaminated reserves in the region. But not only are the gray wolves (similar to the one shown above in Belarus) flourishing, now they are even roaming into surrounding areas, and actually traveling pretty far. And indeed, when they fitted 14 gray wolves with GPS collars in the Belarusian region of the exclusion zone, they found that one adventurous young wolf wandered far beyond the zone’s borders. While the adults stayed close to hime, this plucky juvenile began to regularly move away from its home range about three months after scientists began tracking it, reports Live Science. Over the course of three weeks, the wolf ended up about 186 miles (300 km) outside the exclusion zone. Unfortunately, thanks to a malfunction in the youth’s GPS collar, the researchers have no idea if the wolf actually returned or not. (File under “watch researchers smack their own heads.”) Still, “it’s just cool to see a wolf went that far,” Byrne says. And of which he adds, “We have no evidence to support that this is happening. It is an interesting area of future research, but it is not something I would worry about.” In the meantime, suffice to say that when you take people and human development out of the equation, the animals have a fighting chance. We should do this more often, minus the catastrophic nuclear disasters, of course. The finding were published the European Journal of Wildlife Research. Good news! I hope these animals can live in peace without hunters or any other threat! The world needs more exclusion zones, but not radioactive ones, please. Interesting to say the very least, but we are all aware that it is the human species that are always at the centre of destruction against the planet and its animals. Yay Nature! Now, the wolves had better be careful, or the government will open the area to hunters, and we all know how that ends up.